8 Reasons Why You Can Be Successful Without A College Degree - Motivate Amaze Be GREAT: The Motivation and Inspiration for Self-Improvement you need! What do Steve Jobs, Kanye West, Ellen DeGeneres, Richard Branson, Rachael Ray and Bill Gates have in common? They were extremely successful without a college degree. 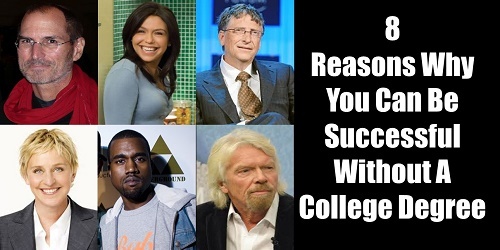 Some were college dropouts others never went to college. As I'm writing this piece, I'm informing you that I have a bachelor's and a master's degree, yes I went the classic route looking for that education. I'm grateful for it, don't get me wrong. But, I came to a time when I realize, that simply wasn't enough for me. The greatest misconception people make is to think knowledge is what it takes to succeed. Indeed you need to have a good philosophy and know things to succeed, but knowledge by itself it's only just information. In college, knowledge tends to be very generic with no form of direct application in your life whatsoever. Simply it's not enough and dispensable in many success cases. The knowledge that takes people without a college degree to succeed is specific knowledge. A form of knowledge that is very specific towards their professional activity. You can only gain that by studying your activity and with experience applying that knowledge, not from a college curriculum. Therefore if you want to succeed in life, you need to learn how to solve specific problems, by getting that specific know-how. When you decide what your goal in life is, you need to search for the knowledge that will help you reach that goal. So, your goals determine the kind of know-how you need. You can get that knowledge from a variety of sources, including college. Yes, we know we may sound contradictory, but some college degrees give the information you need, that is if your goal really relates to that curriculum. But rarely that's enough, so you need other sources of knowledge. Sources like mentors, study groups, books, blogs, articles, your own life experiences, and why not, others experiences. Another misconception people make, is that school ends when you acquire your degree, you've reached that landmark, so now you don't have to study no more in life. It's quite the opposite, that is, if you want to be successful. The learning process never ends. School taught you the general things you need to know in life, and some methods of study you can apply to concrete situations. But you must know how to adapt what you've learned to something specific. An most of the times, you need to find out that knowledge by yourself, school doesn't give you the information you need. You can only do that by becoming a student of life and success. School never ends for those who are ambitious and have the desire to be successful. You can learn a lot of things in college, but curriculum's really lack in showing you concrete situations of your life where you can apply that knowledge. They aren't specific directed to you and your problems, so you don't acquire the necessary information you can apply to solve those problems. That's up to you not to a curriculum. The opportunities to succeed are way more than university degrees, way more, it's impossible for college to cover all the specific situations where people want to succeed at. There are characteristics and abilities that don't depend on a degree. And some really determine the difference between those who are successful and those who aren't. The power of imagination, the indomitable desire to achieve that passion can bring you, the dedication and necessary effort to work hard, those are all abilities you must possess to succeed and don't depend on a degree. You must take the steps and practice those abilities in real life. Take this example, people who received their degree in the 90's learned nothing about social media marketing. Why? They couldn't, cause social media didn't exist at all! How will those people acquire the knowledge to build a brand on social networks or the internet now? They need to acquire the specific knowledge or take a new course about that subject. That just proves you in a world that is constantly changing, a college degree isn't enough. Even if you acquire a degree now, about internet and social media, the world will change with time. 10 years from now that information will serve you too little. The best form of acquiring the necessary knowledge to succeed is by labor. Number one, you're applying knowledge to your concrete reality, therefore, you're compiling lots of information about a specific matter, that will make you better and better with time, but you need to work on it. Your chances of succeeding increase exponentially. Number two, your applying it in conjunction with your own desires and beliefs. Desires and beliefs represent what fuels your life, and when it comes to concrete situations of our real life, we go the extra step, it's our fate that is at stake. Knowledge can only serve you if you apply it, with imagination, passion and dedication. By taking those extra steps, you can get unique information. Specific information that directly relates to your life, and improves the specific areas that make you who you are, and who you want to become. We're not trying to dis-encourage you to go to college with this article, we're just showing that is possible to succeed without a college degree. Although as we've explained, some specific knowledge you need, might be included in a college curriculum, and you can take that course to get that information. If you have a college degree you can be successful, but remember that's not the determinant factor to have great results. You have to learn the specific knowledge part, and make it work!